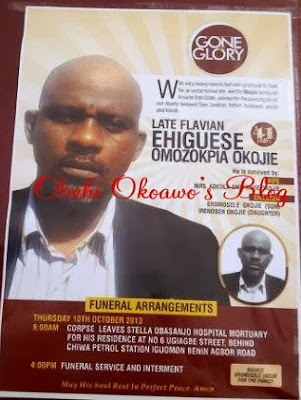 The body of the Popular Edo born Nollywood actor and board of internal revenue staff, Flavian Okojie whose life was cut short on the 2nd of October, 2013, was finally laid to rest yesterday the 11th day of October, 2013 at his house Benin/Agbor Road, Benin City. He is native of Uromi, in Esan North East Local Government, Area, Edo State. Flavian Okojie's two children, a boy and girl were present at the burial but their mother, the first wife of the deceased was however, absent. It was a sad moment for the Okojie family when the undertakers interred the body. Omo-kivie Adeola, Flavian last wife was present at the burial and, was very destruct and down with heavy heart. 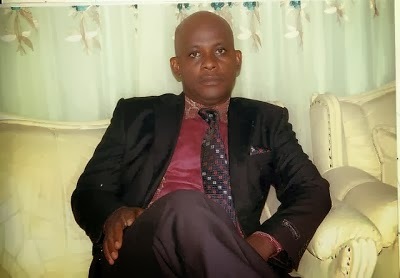 It was saddening that Flavian met his untimely death in Omo-Kivie Adeola's jeep. The look on Omo-kivie's face was a reminiscence of their six years relationship that led to their marriage three weeks before his death. It was a great loss to Adiola, a former staff of of EBS. While at EBS, she was deeply in love with a co- staff, one Emeka O.T. 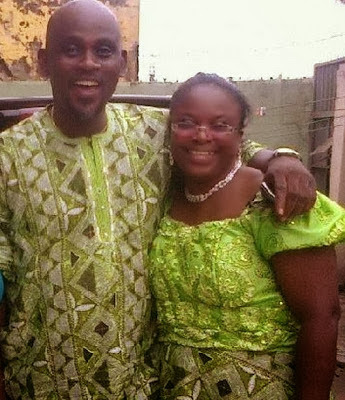 Everybody thought, Adiola and Emeka were going to tie the knot but, ugly issues separated them. Her last relationship before she gained employment to NTA, was with a former GM in one of the local TV station. It was while in NTA she met Flavian Okojie six years ago as lovers and they finally got married three week before his death.